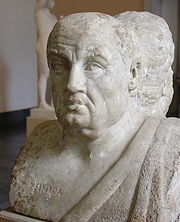 LUCIUS ANNÆUS SENECA, Died 65, A.D. THE greatest name in the Stoic School, and the first of Latin moralists, came into existence at Corduba (Cordova) contemporaneously with the beginning of the Christian era. His family, like that of Ovidius, was of the equestrian order. He was of a feeble physical constitution, and bodily weakness, as with many other great intellects, served to intensify, or perhaps originate mental activity. At the capital, with which he early made acquaintance, he soon gained great distinction at the bar; and the eloquence and fervour displayed by him in the Senate before the Emperor Caius (Caligula) excited the jealous hatred of that insanest of tyrants, who banished him from the city. At this period he visited Hellas and Egypt. Later in life he obtained high office, and, in conjunction with Burrus, pretorian prefect, was appointed to the tutorship (1) of the young Domitius, afterwards the Emperor Nero. On the accession of that prince, at the age of seventeen, to the imperial throne, Seneca became one of his chief advisers: nor should it be forgotten that he dared to dedicate his famous treatise On Clemency to that tyrant. Unhappily for his credit as a philosopher and a Stoic philosopher, while exerting his influence, such as it might be, to restrain the vicious propensities of his former pupil, he acquired not only a moderate proportion of wealth but, apparently, even an enormous fortune; and his villas and gardens were so splendid as to provoke the avarice of the Emperor. This added to his alleged disparagement of the prince's talents for singing and dancing (to fame for which Nero especially aspired) caused his subsequent disgrace and death. By a voluntary surrender of all his possessions the philosopher prudently attempted to anticipate the will of Nero, and vainly sought to disarm the imperial jealousy by a retired, unostentatious, life; but his death, in spite of the hypocritical assurances of Nero (recorded in the distinguished sentences of the historian Tacitus), had already been determined. Charged with complicity in the conspiracy of Piso, the only grace allowed him was to die by his own hands. His wife, Pompeia Paulina (who seems to have been another Arria, celebrated by Tacitus and immortalised by the younger Plinius, by her almost incredible fortitude and the famous "Pœte non dolet") (2) in spite of her husband's remonstrances, chose to die with him, and the two faithful friends laid open their veins at the same moment. Advanced age and his meagre diet had left little blood in Seneca's veins, and it flowed with painful slowness; and to avoid the intolerable pain of being witness of each other's sufferings, they shut themselves up in separate apartments. With the astonishing endurance, which characterised so many of the old Stoic victims of imperial tyranny, the philosopher calmly dictated his last wishes to his surrounding friends. His agonies being still prolonged, he took hemlock; and this, also, failing, he was carried to a vapour stove, by which he was suffocated, and thus, at length, he ceased to suffer. In estimating the character of Seneca, it is just to consider all the circumstances of the exceptional times in which he lived. Perhaps, there never has been an Age or people more utterly corrupt than that of the period of the earlier Roman Cæsars, and that of Rome and the large cities of the Empire. Even if we should adroit the charges of avarice which his enemies brought against him—and, as Tacitus records, the statements of the multiplicity of writers of the Neronian Age are conflicting and derived to a large degree from hostile critics—the moral general character of the author of the treatise on Clemency and the Epistles shines for us in bright relief as contrasted with that of the immense majority of his contemporaries, of equal rank and position, who were sunk in the depths of licentiousness, and of callous indifference to the frightful miseries of the world surrounding them. (3) That his public career did not reach the exalted standard of his later precepts seems to be indisputable and, in the falling short of a loftier ideal, he must share reproach with some of the most admired of the world's intellectual heroes, If we compare him with Cicero or with Francis Bacon, for example, the comparison will scarcely be unfavourable to Seneca. The worst charge brought against him is his connivance at the death of the infamous Agrippina, the mother of his pupil; or rather the apology drawn up by him and read in the Senate. For this line of conduct the only possible excuse could be that suggested by the historian—the suspicion that the mother intended the death of her son; the choice thus lying between the comparative guilt of the two exalted criminals. If such be the truth, the Apology becomes natural and even necessary. As for the unproved charges of complicity in the Pisonian conspiracy, some six years later, when the cruelty and outrageous profligacy of Nero had reached the furthest bounds of criminality, tyrannicide became not a culpable but a praiseworthy act; and if ever, in the long annals of royal tyrants, " killing, no murder," has been a justifiable thesis, it certainly would have been so in the case of Nero. His principle writings are:—De Irâ his earliest and, perhaps, most often quoted work; De Clementiâ, addressed to Nero Cæsar—one of the most meritorious writings of all Antiquity, and not unworthy to be classed with the Degli Delitti e delle Pene of Beccaria, or the similar humanitarian protests of Voltaire. The Stoical distinction between "clemency" and "pity" (misericordia), as the moralist admits, is merely a dispute about words; De Beneficiis ("On Kindnesses"); De Vitâ Beatâ, next to the De Clementiâ and De Irâ, the most admirable of his treatises; De Vitæ Beavitate, in which the reasonable employment of brief human life, and the acquisition of true wisdom are eloquently enforced; De Animi Tranquillitate; De Consolatione—addressed to his mother Helvia—may be ranked with the similar treatise of Plutarch; the Epistolæ ad Lucilium, one hundred and twenty-four in number, abounding in admirable precepts in morality, mixed (it must be allowed) with a large proportion of what may be termed transcendental stoicism and exaggerated asceticism; Quœstiones Naturales, in seven books. As respects the superiority of his mental endowments, the admiration of his contemporaries and of modern authorities is universally consentient. "Splendour and celebrity of his philosophic writings" (their distinguishing humane excellence then, as now, seems not to have attracted attention, or at any rate, remark) is the homage of the great historian of the Empire (Annales xii.) The elder Plinius writes of him as "at the very head of all the literati of that age" (xiv, a). Petrarca, in the fourteenth century, quotes the valuable testimony of Plutarch, "that great man who, Greek though he was, freely confesses there is no Greek writer who could be brought into comparison with him in the department of Morals." How much the "Seneca morale" (as Dante styles him) has been in esteem with all the better thinkers of the mediæval centuries, and with the most eminent thinkers of modern times, from Montaigne down to the leaders of thought in France in the xviii century; and how much of what was higher in morality has been owed, directly or indirectly to his influence, conjoined with that of Plutarch, hardly can be over stated. It is matter for much regret, we shall add in this place, that the "popular" English epitomes of Seneca give, for the most part, so altogether inadequate presentment of the real merits of his writings. With strange perversity, while giving the English reader all the sometimes (it must be confessed) hyperbolic ascetic declamations of Stoicism, they seem (almost industriously) to avoid his humanitarian and practical ethics. With somewhat similar perversity of taste, modern critics and writers point with excess of admiration to the purely subjective, and sometimes almost morbid, reflections of the imperial author of the Private Meditations (ra Els Tavi-. )v) and the Manual of Epiktetus, while, for the most part, they ignore altogether the objective and practical morality of the best Teacher of Antiquity. To his authorship are assigned ten tragedies, which, although disputed by some critics, seem to bear internal evidence of his work both in the rhetorical style and, yet more, in the sentiments. But the high authority of Quintilian and of Tacitus, who assign them to him, alone might seem to be all but conclusive, and to outweigh modern objections. Of these didactic dramas, the Medea has attracted the most attention from the often-quoted very remarkable verses, so applicable to the discovery of the American continent, that they might almost be suspected to be interpolated. (6) The only Latin subject is the Octavia, the one of the tragedies which, probably, is spurious. It receives its title from the unhappy wife of Nero, and daughter of the Emperor Claudius, whose murder in the island of Pandataria (off the Campanian coast) is so graphically described by Tacitus. Poppæa Sabina, the beautiful mistress and afterwards wife of Nero, who had incited him to the murder of his mother and of his first wife (Octavia), and who herself soon perished through his brutal outrage, is, it needs hardly to be stated, a very prominent dramatis persona. The rhetorical and declamatory style of the Tragedies has often been a subject of criticism; but the critics, for the most part, seem to have overlooked the fact, that they were not designed for the stage, but—according to the well-known fashionable practice with Roman literati under the Empire—for recitation before select audiences, or for private reading. This fact, obviously, must largely affect criticism of their character; and, as regards moral or didactic merit, they may, without excess of eulogy, be preferred to the vast majority of modern productions for the stage. "Since I have begun to confide to you with what exceeding ardour I approached the study of philosophy in my youth, I shall not be ashamed to confess the affection with which Sotion [his preceptor] inspired me for the teaching of Pythagoras. He was wont to instruct me on what grounds he himself, and after him, Sextius, had determined to abstain from the flesh of animals. Each had a different reason, but the reason in both instances was a grand one (magnifica). Sotion held that man can find a sufficiency of nourishment without blood shedding, and that cruelty becomes habitual when once the practice of butchering is applied to the gratification of the appetite. He was wont to add that, 'It is our bounden duty to limit the materials of luxury. That, moreover, variety of foods is injurious to health, and not natural to our bodies. If these maxims [of the Pythagorean school] are true, then to abstain from the flesh of animals is to encourage and foster innocence; if ill-founded, at least they teach us frugality and simplicity of living. And what loss have you in losing your cruelty? (quod istic crudelitatis tuæ damnum est?) I merely deprive you of the food of lions and vultures." Seneca here cautiously reveals the jealous suspicion with which the first Cæsars viewed all foreign, and especially quasi-religious, innovations, and his own public compliance, to some extent, with the orthodox dietetic practices. Yet that in private life he continued to practise, as well as to preach, a radical dietary reformation appears sufficiently from his various writings. The refinement and gentleness of his mind is everywhere apparent in them, and they exhibit him as a man of extraordinary sensibility and just feeling. "December is the month," he begins his letter, "when the city [Rome] most especially gives itself up to riotous living (desudat). Free licence is allowed to the public luxury. Every place resounds with the gigantic preparations for eating and gorging, just as if," he adds, "the whole year were not a sort of Saturnalia." On the occasion of a shipwreck, when his fellow-passengers found themselves forced to live upon the scantiest fare, he takes the opportunity to point out how extravagantly superfluous must be the ordinary living of the richer part of a nation? "I now turn to you, whose insatiable and unfathomable gluttony (profunda et insatiabilis gula) searches every land and every sea. Some animals it persecutes with snares and traps, with hunting-nets [the customary method of the battue of that period], with hooks, sparing no sort of toil to obtain them. Excepting from mere caprice or daintiness, there is no peace allowed to any species of beings. Yet how much of all these feasts which you obtain by the agency of innumerable hands do you even so much as touch with your lips, satiated as they are with luxuries? How much of that animal, which has been caught with so much expense or peril, does the dyspeptic and bilious owner taste? Unhappy even in this ! that you perceive not that you hunger more than your belly. Study," he concludes his exhortation to his friend, "not to know more, but to know better." "Are they slaves?" eloquently demands Seneca. "Nay, they are men. Are they slaves? Nay, they live under the same roof (contubernales). Are they slaves? Nay, they are humble friends. Are they slaves? Nay, they are fellow-servants (conservi), if you will consider that both master and servant are equally the creatures of chance. I smile, then at the prevalent opinion which thinks it a disgrace for one to sit down to a meal with his servant. Why is it thought a disgrace, but because arrogant Custom allows a master a crowd of servants to stand round him while he is feasting?" "Will not that man," he asks, "appear to be a very bad father who punishes his children, even for the slightest causes, with constant blows? Which preceptor is the worthier to teach—the one who scarifies his pupils' backs if their memory happens to fail them, or if their eyes make a slight blunder in reading, or he who chooses rather to correct and instruct by admonition and the influence of shame? …You will find that those crimes are most often committed which are most often punished. …Many capital punishments are no less disgraceful to a ruler than are many deaths to a physician. Men are more easily governed by mild laws. (18) The human mind is naturally stubborn and inclined to be perverse, and it more readily follows than is forced. The disposition to cruelty which takes delight in blood and wounds is the characteristic of wild beasts; it is to throw away the human character and to pass into that of a denizen of the woods." "I will do nothing for the sake of opinion; everything for the sake of conscience." "I will so live, as knowing myself to have come into the world for others…I shall recognise the world as my proper country. When ever nature or reason shall demand my last breath, I shall depart with the testimony that I have loved a good conscience, useful pursuits—that I have encroached upon the liberty of no one, least of all my own." "The faults of others we keep constantly before us; our own we hide behind us… A large proportion of mankind are angry, not with the sins, but with the sinners. In regard to supposed offences, many speak falsely to deceive, many because they are themselves deceived." "Of what bad practice have you cured yourself to-day? What vice have you resisted? In what respect are you the better? Rash anger will be moderated, and will finally cease when it rinds itself daily confronted with its judge. What, then, is more useful than this custom of thoroughly weighing the actions of the entire day?" "Nothing will be of more avail than reflections on the nature of mortality. Let each one say to himself, as to another, 'What good is it to declare enmity against such and such persons, as though we were born to live for ever, and to thus waste our very brief existence? What profit is it to employ time which might be spent in honourable pleasures in inflicting pain and torture upon any of our fellow-beings? '…Why rush we to battle? Why do we provoke quarrels? Why, forgetful of our mortal weakness, do we engage in huge hatreds? Fragile beings as we are, why will we rise up to crush others?…Why do we tumultuously and seditiously set life in an uproar? Death stands staring us in the face, and approaches ever nearer and nearer. That moment which you destine for another's destruction perchance may be for your own.…Behold ! death comes, which makes us all equal. While we are in this mortal life, let us cultivate humanity; let us not be a cause of fear or of danger to any of our fellow-mortals. Let us contemn losses, injuries, insults. Let us bear with magnanimity the brief inconveniences of life." "We ought so to live, as though in the sight of all men. We ought so to employ our thoughts, as though some one were able to inspect our inmost soul—and there is one able. For what advantages it that a thing is hidden from men; nothing is hidden from God (Ep. 83. )…Would you propitiate heaven? Be good, He worships God, who imitates [the higher ideal of] Him. How do we act? What principles do we lay down? That we are to refrain from human bloodshed? Is it a great matter to refrain from injuring him to whom you are bound to do good? The whole of human and divine teaching is summed up in this one principle—we are all members of one mighty body. Nature has made us of one kin (cognates), since she has produced us from the same elements and will resolve us into the same elements. She has implanted in us love one for another, and made us for living together in society. She has laid down the laws of right and justice, by which ordinance it is more wretched to injure than to be injured; and by her ordering, our hands are given us to help each the other.…Let us ask what things are, not what they are called. Let us value each thing on its own merits, without thought of the world's opinion. Let us love temperance; let us, before all things, cherish justice.…Our actions will not be right unless the will is first right, for from that proceeds the act." "Humanity forbids us to be arrogant towards our fellows; forbids us to be grasping; shows itself kind and courteous to all, in word, deed, and thought; thinks no evil of another, but rather loves its own highest good, chiefly because it will be of good to another. Do liberal studies [always] inculcate these maxims? No more than they do simplicity of character and moderation; no more than they do frugality and economy of living; no more than they do mercy, which is as sparing of another's blood as it is of its own, and recognises that man is not to use the services of his fellows unnecessarily or prodigally. It will also be sufficiently clear that the ethics of Seneca consist of no mere trials of skill in logomachy; in finely-drawn distinctions between words and names, as does so large a proportion both of modern and ancient dialectics. If so daring a heresy may be forgiven, we venture to suggest that the authorities of our schools and universities would, with no inconsiderable advantage, substitute judicious excerpts from the Morals of Seneca for the Ethics of Aristotle; or, rather, as Latin literature is now in question, for the De Officiis of Cicero. This, however, is perhaps to indulge Utopian speculation too greatly. The mediæval spirit of scholasticism is not yet sufficiently out of favour at the ancient Schools of Scotus and Aquinas. "Seneca præceptis Eloquentiæ et comitate honestá (with gentleness and honest virture) is the expression of Tacitus," referring to this tutorship. With a boldness rarely exampled in the innumerable records of all but incredible servile baseness and submission, on the part of the patricians and Senate, to the atrocious mandates of the sanguinary and vilely-debauched tyrants who ruled the Roman Empire, Seneca (we learn on the authority of Tacitus) to an emissary of Nero asserted, "The bent of his disposition was not to adulation—and no one could know that better than Nero himself, who had oftener experienced his freedom of speech than his servility," Annales xv, 61. A sort of courage for which our own nobility certainly were not famous, under the Tudor despots, in particular. Cf. Juv. Sat. iv., 150-5. Alluding to the current report (noticed by Tacitus) that the Pisonian conspirators had proposed to give the imperial diadem to Seneca rather than to Piso. Had this been an accomplished fact, the Antonine Age would have been anticipated—for a brief period. See Juv. Sat. viii. 212. Jerome, Script. Ecclesiast. The presence of the two most distinguished teachers respectively of the (reformed) Old and of the New Faith, in the capital of the Roman Empire, is at once one of the most remarkable, and one of the most dramatic, instances of strange coincidence in the records of religious history. It is possible that the latter had knowledge of the writings of Seneca: but the total silence of the "Pagan" teacher seems to prove him ignorant of the Pauline Letters. . . . . Nec sit terris ultima Thule."—Med. Aristoteles expressed the universal idea of the slave (in Hellenic and Latin society) in defining him or her to be an "animated machine" (greek omitted)—Ethica. Human slaves were, in fact, regarded in the same light as the non-human slaves are, among European nations, at this day—as without natural rights; and were equally abandoned to the caprice, the cruelty, or the avarice of the owner. As for the atrocities of the Circus, they were regarded by the fashionable, religious, or literary society of the age as are the atrocities of the Christian Tauromachia and bull-ring of Christian Spain of to-day. In a note on this passage Lipsius, the famous Dutch commentator, remarks: "I am quite in accord with this feeling. The constant use of flesh meat (greek omitted) by Europeans makes them stupid and irrational (brutos). Lipsius suggests, with some reason, that Seneca actually wrote repecting his father, the exact opposite, "who had no dislike for this philosophy, but who feared calumny," etc. On this melancholy truth compare Montaigne's Essais. The nations of the West have their intoxicating drinks made from fermented grains. Thus drunkenness prevails all over the world. For these liquors are taken pure, and are not diluted as wine [among the Greeks generally] is; yet, assuredly, the earth thought that she was producing corn. Oh ! the amazing sagacity of our vices. We have discovered how to make even water an instrument of intoxication. "— xiv. 2. "Of half that live, the butcher and the tomb." Compare Juvenal, Martial, Athenæus, Plutarch, and Clement of Alexandria. Ep. cx. Cf. St. Chrysostom (Hom i. Coloss. i.) who seems to have borrowed his equally forcible admonition, on the same subject from Senecca. The force of truth and candour obliges the impartial historian, however reluctantly, to confess that from a very early period of Christianity—at least, of established Christianity—the virtues of humaneness and justice (as regards the two chief typical exhibitions of them—the treatment of slaves and the barbarities of the Circus) were little more conspicuous than under Paganism. As to slaves, it is enough to recall the enactment of the Christian Emperor Gratianus (at the end of the fourth century) by which a slave who bore witness against his master, truly or falsely, was sentenced to be burned alive; and that not before the ninth century were slave marriages regarded as valid by ecclesiastical law. But the notorious fact that slaves were scarcely better (if indeed so much) protected by Law from the cruelty and selfishness of their masters in the United States of America in our own times, than they were (e.g. ), in pre-Christian Athens, may be deemed yet more significant. The Stoic sect, it deserves to be recorded to its credit, had already in the early period of the Empire, proclaimed the doctrine that all men are born free, and that slavery was "a custom of the law of nations, contrary to the law of nature." Dion Chrysostom, the most distinguished of the Hellenic rhetoricians of the Empire, born a few years before the death of Seneca, followed in his footsteps, and protested against the treatment of slaves, and advocated abolition of certain forms of that iniquitous institution. . . As for the Circus, with its horrible brutalities, it was not until many years after Constantine that the human (gladiatorial) shows were abolished; while the equally cruel and demoralising enforced combats and wholesale slaughtering of the non-human victims continued down to the sixth century. The gladiatorial exhibitions, in fact, lingered on in the provinces so late as the time of Salvian, the Christian authority to whom and to St. John Chrysostom we owe so much of our knowledge of the unedifying manners of their contemporaries. The former expressly states that the gradual decay of that "peculiar institution" was owing to the general destitution and misery of the times rather than to express teaching (miseriæ est beneficium non disciplinæ.) What however Is most to the present purpose is the fact, that the slave—that is to say the most hard-worked part of the population was refused flesh-meats. . . . . Perdere et horrenti tunicam non tradere servo?" Cp. Satires I, 93; vi, 475 495; xiv, 15-25. For other expressions of the higher morality of the greatest of Latin satirists, see x, 6o; xv, 131-142. Also, Plinius Secundus, Epist. viii, 16; ix. 21, on human treatment of slaves. In the latter letter he eloquently requests pardon for a slave—or rather a freedman—from his owner—(which may be compared with the more celebrated Letter to Philemon). Plinius, elsewhere referring to the brutal indifference to the sufferings of slaves says of their masters: "whether they are 'great' and 'wise' I know not: I know that they are not men. It is the part of a human being to be affected by grief and pain, to have feeling (sentire)" viii. 16. For further proof of his sensibility, see, (inter alia)Ep. v. 16—on the death of a young girl; and Cp. Juv. Sat. xv. 138-140. Epistola vii. and De Brevitate Vitæ xiv. As to the effect of the gross diet of the later athletes, Ariston (as quoted by Lipsius) compared them to columns in the gymnasium, at once "sleek and stony"—Greek omitted. Diogenes of Sinope, being asked why the athletes seemed always so void of sense and intelligence, replied, "Because they are made up of ox and swine flesh." Galen, the great Greek medical writer of the second century of our æra, makes the same remark upon the proverbial stupidity of this class, and adds: "And this is the universal experience of mankind—that a gross stomach does not make a refined mind." The Greek proverb "Greek omitted" exactly expresses the same experience. Pausanias records the name of the first athlete, at Olympia, in a later age, who trained on flesh—(about 480, B.C.) He states that previously cheese was the most solid part of the diet of the athletes (Greek omitted), Cf. Shakspere: "Fat paunches make lean pates" (Twelfth Night), and Troilus and Cressida (ii. i.) for same sentiment. . . See Terernius (or Diphilus) in the Adelphia (I, i,) and Quintilianus for very just admonitions on this matter. The humane and rational reflections of the great Latin critic on the common practice of flogging children for the most venial faults—especially in schools—are worthy of Seneca, and contrast conspicuously with Christian theory and practice down to our own days. (See Instituta II). Ascharn (Schoolmaster) and Lily (Euphues) deserve high praise, in an age of the most brutal severity, for having expressed the same humane feeling. Ascham's account of the treatment of the Lady Jane Grey by her parents, as told to him by herself, is well known. Among modern protesters against the savage severity of Criminal Codes, Beccaria, Voltaire, Howard, Phillips, and Bentham shine foremost. "The prophets prophesy falsely, the priests bear rule by their means, and the people love to have it so." In the original, "dumb animal" (mutis animalibus)—a term which, it deserves special note, Seneca usually employs, rather than the traditional expressions "beasts" and "brutes." The term "dumb animals" is not strictly accurate, seeing that almost all terrestrials have the use of voice, though it may not be intelligible to human ears. Yet it is, at all events, preferable to the old traditional terms still in general use. It is one of the many marks of the superior sagacity of Seneca that he appears, in a manner, to have anticipated the protests of more reasonable persons against the fashionable unnatural method of preventing disease by implanting disease:—"To be indebted to Disease for seeming Health is a sort of medical nostrum to be abominated" (Abominandum remedii genus sanitatem debere morbo) De Irâ I. An apophthegm which might be adopted as the motto of the anti-vaccination associations. See this finely and wittily illustrated in Micromégas (one of the most exquisite of satires), where the philosopher of the star Sirius proposes the same sort of questions to the contending metaphysicians and savants of our microscopic planet. Quintilian, in his remarks on the education of the young, frequently insists on the importance of a judicious selection of literature for them.—Institutes. Cp. De Benet. I. 15. The eulogy of the founder of the "Garden" by Lucretius ("vivida vis animi pervicit, et extra Processit longe flammantia mænia mundi"), and by Virgilius ("felix, qui potuit rerum cognoscere causas," etc.) and of Juvenalis (Sat. xiii, 123, xiv, 319.) expresses the high estimation in which he was held by the most discerning minds of pre-Christian times. Gassendi, in modern days, has been his principal vindicator. Seneca's Morals (PDF 17mb) - trans Sir Roger L'Estrange, New York, c.1870.